« 3 New Speakers Added to the 10th Annual New York Value Investing Congress! As we’ve seen over the last few weeks, value has comprehensively outperformed glamour stocks since 1951. Value also outperforms the market. Whether we examine the simple fundamental metrics like the price-to-earnings (PE) ratio, the price-to-book value (PB) ratio, and the price-to-cashflow (PCF) ratio, the dividend yield or a compound model of all excluding the dividend yield, all outperform. Set out below are the results of Fama and French backtests of the equal weight portfolios of each metric’s value decile using data from June 1951 to December 2013 and the market. As at December 2013, there were 2,406 firms in the sample. Stocks with negative earnings, cashflow, or book value were excluded. Portfolios are formed on June 30 and rebalanced annually. The “market” here is an equal weight, and total return average of all deciles, and includes stocks with negative earnings, cashflow, or book value. Most of this outperformance is to the upside. When the market turns down, value tends to drawdown along with the market. The following chart shows the drawdowns to each of the value deciles and the market. The chart really shows the enormity of the 2007 to 2009 credit crisis. Outside the 1929 crash, which I’ll examine at a later date, every other drawdown pales beside the credit crisis. This chart shows the performance in a drawdown of each of the value deciles relative to the market. Market drawdowns greater than 10 percent are indicated by the grey bars on the chart. Where the lines for each value metric are below the 0 percent midline, the value metric has drawn down further than the market, and where the lines are above the 0 percent midline, value has outperformed in the drawdown. 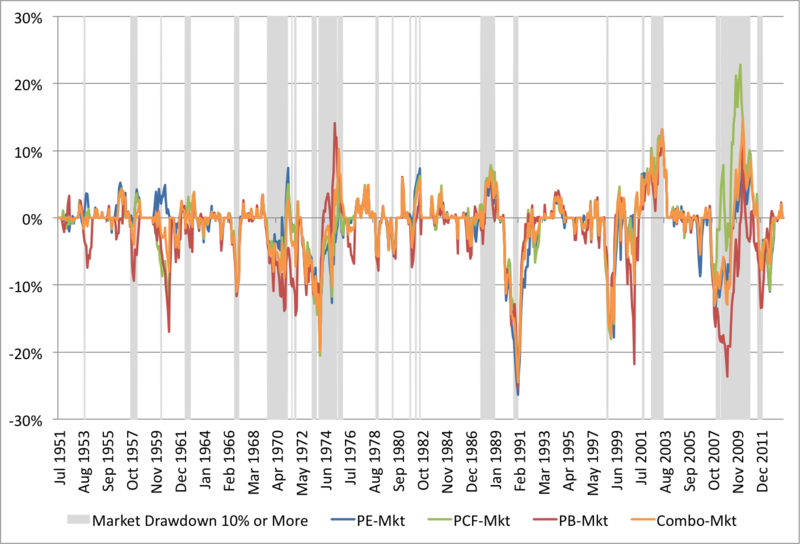 We can see in the chart that, when the market is in a drawdown, the value deciles tend to drawdown faster, and further, and then recover earlier. We can observe this in the late 1990s-from 1998 until 2000–when value struggled, and then from the early 2000s when value outperformed. We can also see it in the last big drawdown from 2007 to late 2008 when value fell further than the market, and then recovered faster from early 2009. In a drawdown, value is below the line about twice as often as it is above the line. Value has comprehensively outperformed the market over a very long period of time. Most of this outperformance seems to the upside. Despite the received wisdom that value has protected portfolios in a drawdown, it seems that value has fallen along with the market. When it does enter a drawdown, value stocks seem to fall first, and at a faster rate than the market, but they also tend to recover earlier, and faster. Volatility and drawdowns are part and parcel of investing. To generate the extraordinary returns of the value deciles, it was necessary to remain fully invested in those value stocks through thick and thin. My firm, Eyquem, offers low cost, fee-only managed accounts that implement a systematic deep value investment strategy. Please contact me by email at toby@eyquem.net or call me by telephone on (646) 535 8629 to learn more. Great article with some great thoughts. I will surely be implementing this into my investment model. When economy starts to bottom buy a lot of value stocks.